The SuggestionPickerField component is designed to search for entity instances according to a string entered by a user. It differs from SearchPickerField in that it refreshes the list of options on each entered symbol without the need to press Enter. The list of options is loaded in background according to the logic defined by the application developer on the server side. SuggestionPickerField is also a PickerField and can contain actions represented by buttons on the right. XML name of the component: suggestionPickerField. The component is implemented for the Web Client. asyncSearchDelayMs - sets the delay between the last key press action and asynchronous search. metaClass - sets the link to the component’s MetaClass if the component is used without binding to a datasource, i.e., without setting datasource and property. 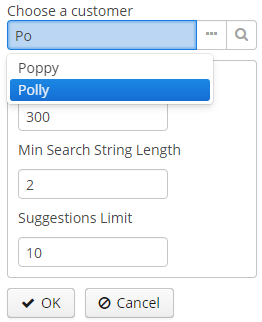 minSearchStringLength - sets the minimal string length which is required to perform suggestions search. suggestionsLimit - sets the limit of suggestions to be displayed. The search() method is executed in a background thread so it cannot access visual components or datasources used by visual components. Call DataManager or a middleware service directly; or process and return data loaded to the screen beforehand. Another way to use the component is to set EnterActionHandler or ArrowDownActionHandler. These listeners are fired when a user presses Enter or Arrow Down keys when the popup with suggestions is hidden. They are also functional interfaces with single method and single parameter - currentSearchString. You can set up your own action handlers and use SuggestionField.showSuggestions() method which accepts the list of entities to show suggestions.